India's final race (until 2015, anyway) was a different beast to that which we have grown to love over the past season and a bit. Rather than the chaotic all-out action that DRS and KERS and the Pirelli tyres provide, this one was all about the strategic thinking. Those that describe F1 as a high-speed chess match could use the Indian Grand Prix as their example. Team had to choose the optimum strategy, and with two drivers that meant splitting the difference in a lot of cases. It worked out for some and not for others, and of course the title was decided along the way. 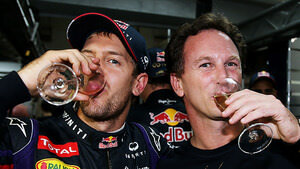 Red Bull finally wrapped up both the championships – something that has been coming for a long time. It wasn’t a surprise to any that Sebastian Vettel won in India, he’d led every lap of the previous two races and was top of every single session. Strategy made things slightly more interesting, in that Vettel was starting the race on the least favourable tyre, whilst teammate Webber was on the more durable compound. Mark retired from the race after a flurry of radio traffic. At first he reported a gearbox issue to the team, but then said that appeared to have go away. Moments later, they were telling him to stop the car due to an alternator failure. Regardless of the reliability issues, Red Bull secured their fourth championship in a row, with a massive points advantage over their nearest rivals. It’s up to everyone else to improve, and next year’s regulation overhaul is just the time to do it. With the main championship fight over, the battle for second place is the one our attention turns to. Ferrari and Mercedes have been going at it all season, but the balance tipped in Mercedes’ favour in India. The team were vocal from the start that Red Bull were unbeatable, and Nico Rosberg said he was always aiming to be “best of the rest” in qualifying, which is exactly what he achieved. Lewis Hamilton wasn’t far behind him, with both drivers pleased about the progress made during the practice sessions. Rosberg also managed to achieve his aim in the race as well, finishing second behind Vettel. Felipe Massa got his Ferrari ahead of both the Mercedes pair on the first lap, and neither could find a way past him on track. Rosberg jumped Massa during the pit stops, but Hamilton couldn’t do the same. The fight to get past the Ferrari wasn’t friendly towards his tyres, either, so Lewis had to settle for sixth. Mercedes have improved this weekend, and their strong points haul puts them back up ahead of Ferrari in the constructor’s championship. They’ve also regained some of the pace they had earlier in the season, and finished very well compared to their rivals. Massa aside, the pace looked to be on the Mercedes car throughout the weekend, and although not a patch on Red Bull, they may be able to cling on to second place over the next three race weekends. We have had a good afternoon compared to our direct rivals today but there is still a long way to go until we can say mission accomplished. There is no complacency and our target will be to deliver another three strong weekends this season. Inter-team issues raise their head yet again, as Lotus admit they will be having a talk with their drivers before the Abu Dhabi Grand Prix. A strategy call in qualifying cost Grosjean any chance of a good grid slot. Left on the medium compounds when everyone else but Vettel was on the softs. He was out in the first session, whilst Räikkönen found his way into the top ten. During the race, Grosjean was helped by a good strategy and a very strong first stint on the soft compounds to storm his way through the field. In the latter stages, he rapidly caught up to his teammate in fourth place – Kimi struggling on tyres that were too old to get to the end. The tussle as Romain tried to get past cost him a little time, but could have been worse, as he ended up all the way off track. Team boss Éric Boullier admits they thought Kimi could have been a little bit easier on his teammate, as seeing your two cars going at it and pushing each other off track is a recipe for a heart attack on the pit wall. Nevertheless, Grosjean did find a way past, and moved up another place when Webber’s alternator failed. From 17th on the grid to a podium finish was an impressive run, one that Kimi had been famous for earlier in the season. The Finn has complained about the new tyres hurting his performance, but he had a solid points finish in India, and could get on top of them before the season is out. In terms of the championship, Lotus still have Ferrari in their sights – just 24 points sitting between the two. It’d be a tough ask, but Romain appears to be on a roll, and Kimi just likes to drive, so there could be plenty of points up for grabs in the final three races. From the outside, and on paper, the result of the Indian Grand Prix point towards a lack of motivation on Fernando Alonso’s side. The championship was long gone, even team principal Stefano Domenicali admitted they knew it was a lost cause when things didn’t improve after the summer. Meanwhile, Felipe Massa is on the hunt for a new drive – motivated to do the best he possibly can. Massa, who has been in talks with Williams for a future race seat, qualified ahead of his teammate, and put in a storming drive to finish in the top four. Master of understatement, the Brazilian called it a “nice” race, but it was a good strategy, delivered well after a storming start. Massa’s surge past both Mercedes on the first lap was brilliant, and although it didn’t last, he did keep the place over Lewis Hamilton. The team should now be totally focused on 2014 – if Stefano’s comments didn’t prove that, the championship being over must do so. There’s a lot still to do before the off-season testing if they want to get their wind tunnel working and start bringing upgrades that make a difference. Last year we could have won the title without having the best car. But we were good in the other elements you need to make sure that you are a winning team. This year I think we were not really good in developing the car and managing the tyres. This was a big thing for our performance, no doubt. Jenson Button has been vocal before about the difficulty he has accepting the new way Formula One works. Having qualifying in the top ten, he was disappointed to be starting on the grid from the lowest position that Q3 has to offer - because he, and teammate Sergio Pérez, sacrificed qualifying performance for starting the race on the medium tyres. The strategy worked for Pérez, who hailed a blissfully bad luck free race in which he finished well into the points. Tucked up behind Felipe Massa, the points haul was impressive for a driver who has struggled to get to grips with his new machinery so far this season. A particular highlight for the Mexican was flying past two World Champions in one move - dispatching both Kimi Räikkönen and Lewis Hamilton as the pair were too engrossed in their own battle to react. For Button, things could have worked out well, but it all went up in smoke on the very first lap. Contact between himself and Fernando Alonso damaged the car and gave him a puncture, forcing an early stop which then cost him the advantage that would have been gained from starting on the mediums. Even with the mix of luck and strategy calls, McLaren must take heart from the better performance shown. Now a regular fixture at the sharper end of qualifying, and racing for good strong points finishes. This is just the kind of thing they need to roll into 2014 with a bit of positive momentum. Neither Force India driver appeared to have anything to complain about after qualifying, the pair were safely into Q2 and firmly in the middle of the pack. They also both felt like there was a bit more to come from the car, whether it was down to the setup not being quite right, or a self-confessed mistake or two round the final flying laps. Confidence was high going into the race, and Adrian Sutil risked it all on a one-stop strategy. For a while, it looked as though he might be attempting a no-stop strategy, becoming the last runner to dive into the pit lane for a fresh set of rubber. Having told his team that the medium compounds were holding up perfectly, Sutil went long into the race but even he, eventually, had to swap to the softs. The aim for both drivers was to get into the points, and they both managed to achieve it. Sutil's long first stint helped him up the order as far as he could go, whilst Di Resta went for the opposite strategy. He dived into the pit lane on the first lap to ditch the soft tyres, which then allowed him to run for the rest of the afternoon on the more durable compound. Good strategy calls from the team, solid racing by the boys, and a successful afternoon's work for Force India at their home Grand Prix. They've also increased the gap in the championship standings to the chasing team of Sauber, which should give them a bit of breathing space going into the final three races. Not enough to get complacent, mind you. Toro Rosso, and Vergne in particular, had a very anonymous weekend. Daniel Ricciardo looked for a moment as though he might make it into the top ten on Saturday, but after posting a time good enough for P9, he gradually dropped out and finished in 11th instead. Vergne had a reasonable qualifying compared to some of his previous performances, and finished the afternoon just a couple of places behind his teammate. Both drivers managed to improve one place in the race, which meant Ricciardo picked up a point. Toro Rosso had the Force India drivers in their sights, but Daniel couldn't quite keep up their pace and had to settle into position behind them. The strategy worked well, though, and they kept out of trouble - particularly at the start of the race, which was on the chaotic side. Vergne took the strategy of coming in early and getting rid of the soft tyre, but he didn't quite match his teammate's points finish. This weekend proves the point that qualifying higher up can help you, but from Vergne's point of view, there is still some work needed to be done to make the difference during the race as well. As for ourselves, we knew it would be a very close fight in the mid-field, with so many cars having similar pace and that's what we got. Valtteri Bottas must have been surprised when he crossed the line in qualifying and found that he had ditched Romain Grosjean out of the first session. He went on to qualify higher than teammate Pastor Maldonado as well, with three places between the two. Pastor blames the performance on getting caught up with traffic, however. In the race, it was a collection of little niggles that made the afternoon difficult for Bottas, but for Maldonado things were slightly smoother. He not only got ahead of his teammate, he managed to move up to twelfth, just missing out on points but finding some good pace in the Williams. Bottas had a radio failure that meant he missed his planned pit stop and came in later than the strategy would ideally dictate. The team were also being very careful in their pit stops - on both cars - to ensure there were no errant wheel nuts or possibilities for loose wheels. Having had two safety failures on wheels in as many race weekends, the team have found themselves with a couple of hefty fines, and, as Xevi Pujolar puts it, pit stops that were "compromised to ensure safety." With that in mind, the result isn't too bad considering how Williams have been performing up to this point. Sauber's performance reverted to normal this weekend, with qualifying split. Nico Hülkenberg was strong and moved up through into the top ten, whilst Gutiérrez was lucky to get out of Q1. Esteban explained afterwards that he was finding it very difficult to get comfortable on track, particularly with the kerbs. He hit one of them very hard, which not only was distracting but also made his neck start to hurt. It's not a surprise that he wasn't quite on the pace of his teammate, then. Eager to get the race going on Sunday, Esteban jumped the start and earned himself a drive through penalty. He's disappointed in himself for that, naturally, but otherwise is quite positive about the weekend. The list is interesting: learned a lot, had good fights with Alonso and Grosjean, found the car to have good balance and gained valuable experience. Everything a rookie driver could wish for, really. In the fight between Sauber and Force India, the latter took a bit of a step forward. There are still enough races left to make the difference, but it will be harder if Force India have the momentum and Sauber do not. Neither driver finished in the points this weekend, with Hülkenberg retiring the car and ending his run of four points finishes in a row. Disappointing for the team, but they can only move forward from here. Marussia managed to finish both cars ahead of the Caterhams, but the result isn't comparable given the double DNF of the green team. One of the retirements was brought about by Max Chilton, as well, with a very angry Giedo van der Garde on the radio branding the Brit an "idiot." Max didn't let it get to him, though, and despite some niggles on the car that were almost race-ending, he drove through and finished ahead of his teammate. Bianchi was disappointed with his afternoon's work, although he finished close behind Chilton. The strategies were quite similar, rather than the split decisions some of the other teams made, but Bianchi had a lengthy pit stop towards the start of the race that cost a lot of time. Without the Caterhams to fight with, the two teammates were doing battle with each other - and this time it was Chilton that came out on top, giving him a bit of confidence going into the final races. The Caterhams found themselves sandwiched between the two Marussia cars on the grid, but it wasn't to last long. Giedo van der Garde bemoans Chilton not leaving him enough room into the first corner, which meant contact was inevitable. The front wing and suspension on the green car was broken, and Giedo's race was over. However, that was not before he had time to be squeezed into the side of his teammate. Pic picked up a picture from the contact with Giedo, and had to pit early. The strategy was obviously compromised, but it didn't matter in the end. Another puncture later saw him back in the pit lane at which point the race was effectively lost. Pic reported a loss of hydraulic pressure which eventually saw him retire from the race. As the man himself says: "Overall, this has been a bit of a tough weekend, but we'll keep fighting, next weekend and for the rest of the season."